Today British MPs will hold another debate and vote on whether or not they accept leaving on March 29 with no deal. If they do not then there will be yet another debate and vote tomorrow on whether to ask the EU for an extension to the article 50 period. France’s Europe Minister Nathalie Loiseau tweeted that the rejection was “bad news”, adding “we’ve come to the end of the negotiations on the conditions for withdrawal”. A spokeswoman for the European Commission, which leads the negotiations, said the 27 would “consider” any request for extension but would have to agree it unanimously, bearing in mind the reasons given and the length of time asked for. Extending the period into July when the new MEPs will take their seats after the European elections in May would cause additional complications, as the UK would be expected to have MEPs again. Even if MPs vote again today to reject a no-deal, as they already did in a non-binding motion recently, it does not mean the UK cannot leave with no deal – the date of March 29 is fixed by the rules of the article 50 process (two years after the ‘trigger’). It is also now set in the UK’s European Union (Withdrawal) Act 2018, which cancels the operation of EU law in the UK, as being the date of ‘exit day’ (this would have to be amended if there is an agreement to extend). Unless there are further changes to the withdrawal agreement – which the EU says will not be made – likely options now include leaving with no deal or obtaining an extension for a ‘clear’ reason such as another referendum or a general election. The UK also has the right to cancel Brexit unilaterally. 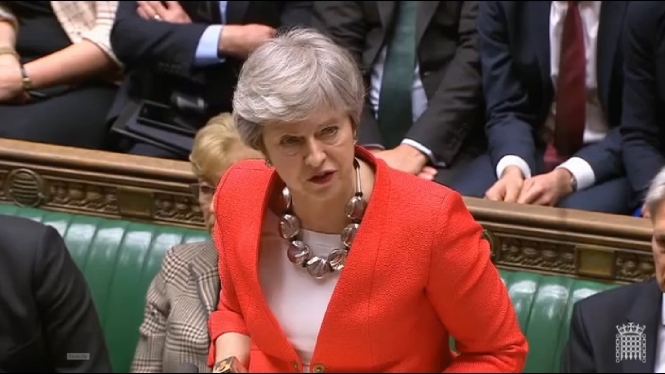 Speaking to the MPs last night Prime Minister Theresa May said if they rejected the deal again there would be “bleak” choices, one being to leave with no-deal, which she said would cause significant “economic shock” in the short-term with impacts on businesses and families. She said the UK would also “lose the security co-operation that helps to keep us safe from crime, terrorism and other threats, and we would risk weakening support for our Union,” adding that no-deal would increase support for Scottish independence and a united Ireland. As for asking for an extension, Mrs May said this would hand back power to the EU, who could choose how long it is. They could also impose conditions. That could mean having a form of Brexit that is not what leave voters wanted, or even holding a second referendum, she said. “If any of those things were to happen, it would be no good blaming the European Union. Responsibility would lie with this house for our failure to come together in the national interest to deliver on the vote of the British people,” Mrs May said.